One cold November night in 2014, in a small town in the north west of England, 26-year-old Arla Macleod bludgeoned her mother, father and younger sister to death with a hammer, in an unprovoked attack known as the 'Macleod Massacre'. Now incarcerated at a medium-security mental-health institution, Arla will speak to no one but Scott King, an investigative journalist, whose `Six Stories' podcasts have become an internet sensation. King finds himself immersed in an increasingly complex case, interviewing five witnesses and Arla herself, as he questions whether Arla's responsibility for the massacre was a diminished as her legal team made out. As he unpicks the stories, he finds himself thrust into a world of deadly forbidden `games', online trolls, and the mysterious Black-eyed Children, whose presence extends far beyond the delusions of a murderess... 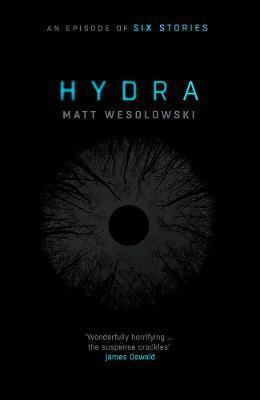 Dark, chilling and gripping, Hydra is both a classic murder mystery and an up-to-the-minute, startling thriller, that shines light in places you may never, ever want to see again.